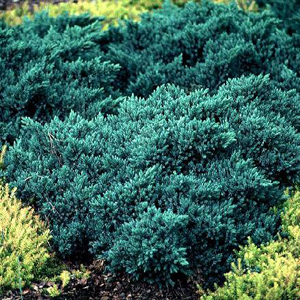 The Blue Star Juniper originated as a branch sport of Juniperus squamata 'Meyeri' in Holland in about 1950, which indirectly puts the origin of this plant in China, which is where the 'Meyeri' Juniper was found by F.N. Meyer and introduced to the United States (in the 1910's). It's draw is it's beautifully rich blue foliage, compact size and dense growth. This plant is a slow grower, and at maturity it will only stand 3' tall with a slightly wider spread. It prefers full sun but will also do well in partial sun, and will be happy in most any soil, acidic or alkaline, so long as it's well-drained.